Not only can you pass away lazy days along Mexico’s Caribbean or Pacific coastline you can also explore Mexico’s natural wonders such as the Copper Canyon or the coral reefs off the Yucatan. 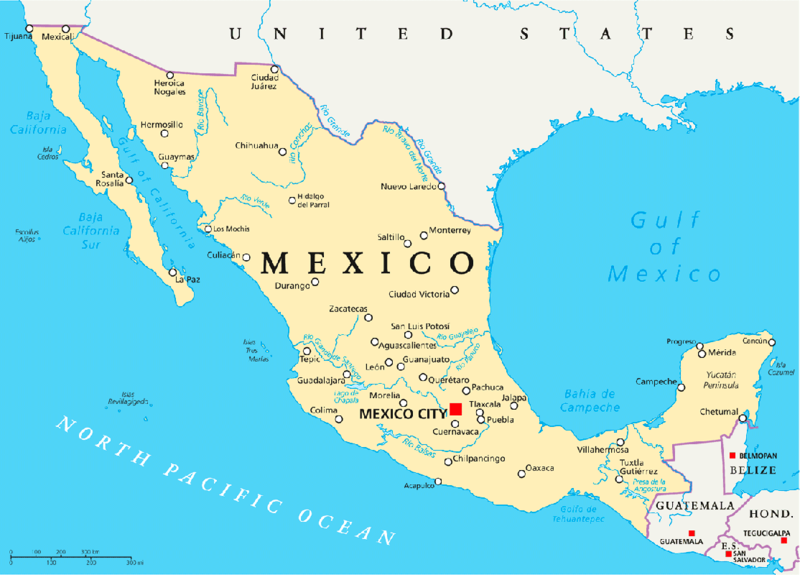 Mexico City, the oldest city in the Americas was originally built on an island of Lake Texcoco by the Aztecs in 1325 as Tenochtitlan. Following a seige, which almost destroyed Tenochtitlan, the Spanish founded Mexico City, the modern day capital, in 1521. Today it is not for the faint hearted, being both the oldest, continuously inhabited, city in the Western Hemisphere and also in the top ten largest cities in the world. It has some of the world’s finest museums, situated around the Cathedral and Zocalo, the main square area, so set aside some time to dedicate to these. Just outside Mexico City is the ancient Aztec city of Teotihuacan, once the centre of the Aztec Empire and perhaps the most awe-inspiring historical site in the whole of Mexico. At 34 square km, the ‘City of the Gods’ was the most urban centre of its time. Its principal structures include the massive Pyramid of the Sun, the smaller but equally impressive, Pyramid of the Moon, the Grand Avenue of the Dead and the Temple of Quetzalcoatl, with its enormous ornamental snakeheads. The Yucatan Peninsula, on Mexico’s Caribbean coast, is rich in Mayan heritage, colonial haciendas and, ignoring the monstrous and over touristy Cancun, some of the country’s finest beaches. The Yucatan capital, Merida, standing on the Mayan ruins of Tihoo, combines colonial architecture with colourful Indian heritage, and provides easy access to the peninsula’s Mayan treasures of Chichen Itza and Uxmal. Small hacienda style properties, created from original colonial buildings, provide a charming off-the-beaten-track Mexican experience away from any crowds. The Central Highlands (north-west of Mexico City) are home to the best examples of Mexico’s colonial heritage.This was where the Spanish found silver and built some of the country’s most magnificent cities. Guanajuato and San Miguel de Allende are prime examples of Spanish colonialism and today life still centres around the tree shaded main square, with its wrought iron bandstand and towering churches. Near the beautiful colonial town of Morelia is the village of Angangueo and its famous butterfly sanctuary. This is an undisputed natural phenomenon, where literally tens of millions of Monarch butterflies spend the winter following their extraordinary migration from Canada. They congregate with such intensity that the trees are alive with colour. For further impressive wildlife, head out to sea. Beneath the waves off the Yucatan lie the impressive coral reefs, while on the Pacific side, the marine reserve of The Sea of Cortez is a natural aquarium for grey and humpback whales (January-March), dolphins and sea turtles. To the south of Mexico City are the beautiful cities of Oaxaca and San Cristobel de las Casas, in neighbouring Chiapas state. Strong indigenous cultures have existed here for centuries and, if you are looking for local textiles and handicrafts, then this is where you must come. Here also is Palenque, yet another piece of monumental Mayan archaeology where stone palaces lie hidden deep in verdant jungle. Most of Mexico has a pleasant, sunny climate all year long. The Caribbean coast sees tropical rain peaking between May and September, and is heaviest on the Cancun and Acapulco coasts. The deserts of the Baja Peninsula and coast along the Sea of Cortez are good all year round, though cooler in January and February. North central Mexico sees hot, dry summers and cold winters. November for the festival of the Day of the Dead, November to February for the Monarch butterfly migration, January – March for whale watching, and June – January for turtle nesting/hatching.